So, perhaps your bathroom is ready for a remodel – a fresh coat of paint on the walls and trim and some decor that will highlight the colors you choose. There are so many different styles out there that you might be at a loss over which one to use. To help sort it all out, let’s take a look at some bathroom styles and how you can make them happen in your home. A traditional bathroom is one that keeps up with modern style, changing along with contemporary fashion. So, while a traditional bathroom might be somewhat flexible, these classic bathrooms have a focus on standard comfort and appearance that makes them a recognizable trend. Color options for a classic bathroom are dependable and always work for a bathroom remodel. Gray, white, and off-white/cream create an atmosphere that can be rustic or elegant according to the design of your bathroom. For example, a bathroom with gray wall tile, off-white countertop, and a white vanity is relaxing and classy all at once. Off-white, beige, and pale blue provide a traditional look without entirely erasing creative possibilities. A remodel that includes pale blue walls, a vanity that’s off-white, and light beige flooring will look great and will be versatile enough to fit individual preferences. Speaking of luxury bathrooms, what sets an upscale bathroom apart from a traditional one? First of all, expensive materials like some types of natural stone are often part of creating a high-end bathroom. Additionally, these luxury bathrooms usually feature a stunning color scheme that leaves a lasting impression of elegance. So, if you’re looking into a luxury remodel, finding the right color scheme is essential. While it’s up to you to get as creative as you like with your bathroom remodel, consider a few common luxurious color combos before you make your final decision. Many high-end bathrooms include natural stone; marble is especially popular. Depending on how much marble you want in your bathroom, you’ll need to make sure that your color scheme centers around the colors in the marble. White or light gray Carrara marble bathrooms usually stay with mild neutral colors like light grays, beiges, and off-whites. To bring in some color, add light blues and greens to your palette; pale blue and green tones will match well with the undertones of Carrara marble. Black marble bathrooms are equally beautiful and trendy. Luxury bathroom remodels with black marble as a major component tend to follow one of these styles: (1) The black marble has all-black surroundings; everything is black, except for a few decorations. (2) The black marble contrasts with white furnishings, such as a jetted tub, a white vanity and countertop, or white decor pieces. Minimalist bathrooms are pretty simple. While they’re still designed to keep a certain amount of comfort and visual appeal, minimalist style bathrooms are the opposite of luxury bathrooms – they’re anything but luxurious, in fact. Instead, minimalist bathrooms are usually practical, efficient, and uncluttered. Organization is the top priority in these bathrooms. Typically, minimalist color schemes stick to neutral colors – white, light gray, brown, and off-white are the most common colors used in a minimalist bathroom. Any combination of these colors is perfect for the minimalist bathroom remodel. If you need an accent or contrast color, add a potted plant to complete the minimalist look. Honestly, there are no rules when it comes to a bohemian bathroom. 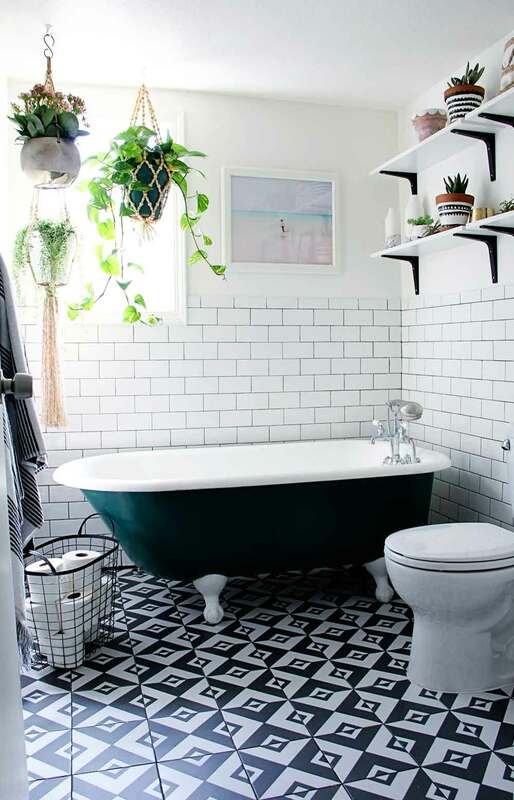 The exact opposite of the minimalist bathroom, a bohemian style bathroom is all about individuality and mix-and-match decor. A bathroom with a bohemian theme is all about various colors, patterns, and art expressions chosen by the homeowner to fit his or her individual tastes. There are a few guidelines to this style that will help you create your ideal bohemian bathroom. Decor that’s inspired by countries like India and Asia often has a natural bohemian feel that’ll add to your bathroom design. Potted plants are a significant part of the bohemian expression – the more, the better! Artwork such as colorful paintings or framed patterns are essential to a bohemian bathroom. Don’t be shy – choose your favorite artwork and find a home for it in your bathroom! Keep in mind that what matters most is that you enjoy the atmosphere you’ve created during your bathroom remodel. Even if your remodel doesn’t fit into any of the categories we’ve described, it’ll still have something other remodels lack – individuality that’s unique to your design preferences. Your best option is to just make sure you love the new look you’re bringing to your home interior!